Long Beach, Calif. – April 12, 2015 – Formula DRIFT presented by GoPro kicked-off the first event of the 2015 World Championship season with Round 1: Streets of Long Beach to a sold out crowd. Fredric Aasbo in the Rockstar Energy Drink / Hankook Tire Scion tC takes the victory and the lead in the chase for the championship. 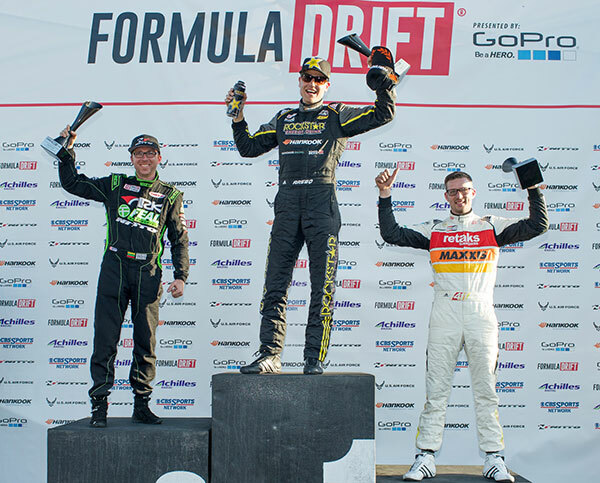 Round 1: Streets of Long Beach started off the twelfth season of Formula DRIFT to a sell out crowd. Over 20,000 fans experienced the action and excitement at the Streets of Long Beach Grand Prix Street Course through the weekend. The Dailymotion Livestream partnership saw over 300,000 unique viewers watch the Driftstream over the event weekend. After coming a few points short of his first title last season, Fredric Aasbo, kept the momentum that he gained through the second half of the 2014 season going and took the top spot on the podium after a few close battles. Ryan Tuerck in the Ryan Tuerck Racing / Retaks / Maxxis Tires Scion FR-S was unable to make the necessary mechanical change within the five minute allotment which forced him out of the competition to land in third place. The final battle saw Aasbo and Aurimas Bakchis in the Feal Suspension / ARK Performance / Nitto Tire Hyundai Genesis Coupe. Aasbo edged out Bakchis to take the event victory. For more information visit: www.formuladrift.com and find Formula DRIFT on Instagram, Facebook and Twitter. Tanner Foust drifts his Rockstar Energy Drink Scion TC Drift Car on a legendary stretch of Mulholland Highway. Known as “The Snake”, this stretch of Mulholland in Malibu just east of Kanan Road is a famous hangout for SoCal motorcyclists and car enthusiasts. The two mile ribbon of road winds uphill through the Malibu mountains between the Rockstore Café where thousands of bikers convene every Sunday and “The Gallery”—a viewpoint where much of the road below can be viewed. Watch as Tanner Foust unleashes his 600hp NASCAR V8 powered Scion drift car on this famed road. There were no rehearsals and most of the film is of Tanner’s first run on a clean stretch of road. Notice how he paints a line of black rubber on the virgin tarmac, running inches from the guard rails and rock walls of the canyon. The howl of the motor, screeching tires and billowing smoke contrast with Foust’s almost zen like motions in-car. The road was closed and Tanner is a trained professional so please don’t try and re-create.